Our pros can help you identify what distinguishes you from the competition. Rarely available to small and mid-size companies on an affordable basis, these services are made accessible by Pulse to help tell your story in an effective, business-generating way using tools and methods usually reserved for larger companies with their own Marketing and PR staffs or expensive outside agencies. Your profile will include what you want in terms of company background, mission, unique services, projects, or other matters that you consider to be your best sales items, professionally written (including professional editorial assistance in selecting and phrasing the content to your benefit) and laid out on a two-sided sheet, with one side showcasing your impressive Pulse Customer Satisfaction Award image attesting to your independently verified excellence in the eyes of your customers. The profile will also feature your company logo, emblem, signature project, or other digital files you supply to us for inclusion in the document by our professional designers and layout experts. After the collaboration to identify your best presentation, you receive: 1) a digital file (both PDF and WORD) of your Company Profile ready to place on your website, Facebook, and other media, including adding to your email signature as an attachment to your routine communications, 2) the right to use the digital profile in any way you wish (enabling you to update it or tailor it for specific presentations or uses in the future) along with the ability to do so without outside assistance and expense because you receive it in an unlocked PDF and WORD format*, and 3) also 500 full-color, two-sided, glossy prints with your award plaque image on the reverse side of the Profile sheets, ready to use. Your right and ability to edit and reproduce the Profile text and your images included in it lets you use and reuse the Profile for multiple purposes (general info on your company, tailored to feature a specific past project, tailored to a specific service you are marketing or target customer or group of prospects including naming them in the Profile document, updating over time, etc.) without incurring the costs of editing and preparation over and over. 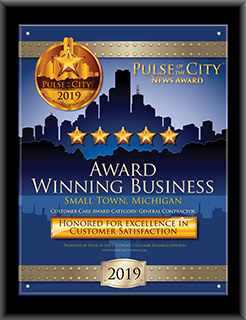 Note: If you want help adapting the Profile in the future, or a larger, multi-page portfolio presentation, Pulse offers the option of contract writing and publishing services on an affordable basis: please contact us at 866-732-9500 or customercare@PulseoftheCityNews.com. You can use your Profile in brochures, handouts, mailers, flyers, supplements to presentation and RFP packets, etc. There is no better way to separate you from the pack than with a professional-quality Company Profile! To discuss a larger, multi-page portfolio presentation, please contact us at 866-732-9500 or customercare@PulseoftheCityNews.com. *The Pulse of the City News graphics included in the Profile are trademarked and may not be modified, reproduced or used other than as part of the Profile except with Pulse’s licensing terms included with your purchase of the Profile or a marketing package.